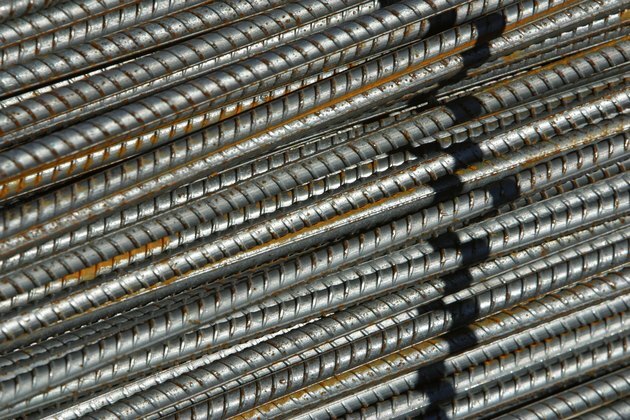 Reinforcing bars (rebars) are an important component of concrete slabs, because they reinforce the cement and increase its load-bearing capacity. The rebar needs to be correctly spaced, however. Rebar that's too far apart lacks the tensile strength to reinforce the concrete sufficiently, but when it's too close, the cement in the slab won't mechanically bond to develop its own tensile strength. There's no generally-accepted rule of thumb as to how to space rebar in a concrete slab. There are many variables that influence the decision of how much space to leave, including the maximum load the slab is likely to have to support, the bearing capacity of the soil, the diameter of the reinforcing rebar, the likelihood of frost heaving the slab, and whether or not the slab is on a level grade. The steeper the grade, the more heavy loads will stress the slab, and the more reinforcement will be required. The same variables influence the type of concrete to be poured for the slab and how thick to pour it. However, many engineers suggest a minimum distance of one slab thickness between rebars and a maximum of three slab thicknesses. For slabs with relatively small maximum load-bearing capacities, it may not be necessary to use rebar at all. For such slabs, a welded wire mesh with six-inch holes will suffice to reinforce the slab. Another recent development in pouring concrete structures such as slabs is to add polypropylene fibers to the concrete, which then form a three-dimensional mesh to reinforce the slab. The chemical-mechanical bond the fibers form with the concrete can be superior, depending on what the structure is used for, to rebar reinforcement. How Long Before Using New Concrete Patio?